As taxi cabs go unregulated, some civilians say they are spending the majority of their wages getting to work each day. But drivers say fuel hikes and other operating costs necessitate the higher fares. Hala, an office worker in Damascus, describes her daily commute to work as a lengthy ordeal that’s becoming even longer – and pricier – as transportation snarls hit the capital. Damascenes describe finding safe transportation as an increasingly expensive ordeal. Damascenes describe finding safe transportation as an increasingly expensive ordeal, saying they find themselves at the mercy of taxi drivers who, unchecked by a distracted government, have illegally hiked their prices. Damascus used to be flooded with cheap public transport like buses, minibuses and share taxis, but the routes on which they operate have been drastically scaled back by the city as resources are diverted elsewhere. Often the only option is a pricey private cab. Many have stopped using them altogether, opting to walk whenever possible. But those with longer commutes still find themselves forced to pay exorbitant amounts of money to get to work. Raed, who works on bustling Baghdad Street downtown, says that his daily journey to the office includes taking a shared cab, also known as service, from his countryside home in Jaramana to central Bab Touma or Abbaseen Square. From there, he walks the rest of the way, as the only transport option in the area is an expensive private taxi. The cab, he says, would cost him about 150 Syrian pounds, most of his daily salary. The cab, he says, would cost him about 150 Syrian pounds, most of his daily salary. But the city’s cabbies say they’re playing fair. There are 13,000 registered vehicles on the city’s roads, but only 3,000 of them are for public transport in use. Zakaria Yaghi, president of the Union of Road Transport Workers in Damascus, says there are 13,000 registered vehicles on the city’s roads, but only 3,000 of them are for public transport in use. The sharp decline in the availability of transportation vehicles happened, he claims, after the Interior Transportation Company (ITC), which controls buses and microbuses, scaled back on its services, with buses now only serving a handful of routes. 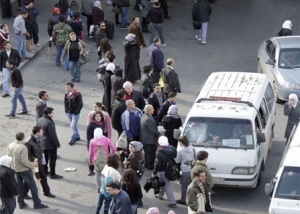 Before the conflict, 185 public transport vehicles worked the heavily trafficked Jdeideh-Artouz route. Now it’s served by just 40. The popular Qatna route, once covered by 300, now has only 50 public share taxis. The government and drivers blame each other for the city’s transport woes. Before the conflict, 185 public transport vehicles worked the Jdeideh-Artouz route. Now it’s served by just 40. Midani adds that there are plans to provide government-subsidized gas tanks at taxi stations to make things easier for the drivers. He says there are 25,000 cabs in Damascus, and only 100 drivers have filed complaints with the transport branch. As the employment rate rises, many with cars have taken to using them as gypsy cabs. Damascenes are taking matters into their own hands. As the employment rate rises, many with cars have taken to using them as gypsy cabs, a popular practice in other Arab countries. And in response to civilian complaints, the governorate announced that it will launch the Taxi Service Initiative in May. Covering 12 of the capital’s most popular routes, it will work to monitor and standardize fares. Aliqtisadi is an Arabic-language business news portal that covers several countries including the UAE, Saudi Arabia, Egypt, Lebanon, Palestine and United Kingdom. It is published by Haykal Media, based in twofour54, Abu Dhabi, UAE.